An easy-to-use, convenient, secure storage option for your courier deliveries. The Porch Pirate Chest is one of the newest solutions to prevent package theft on the market today. Not only is the Porch Pirate Chest a highly secure way to prevent packages from being stolen until they are retrieved by online shoppers, but the chest might also be one of the most versatile solutions we have tested to date. Continue reading below for our full review of the Porch Pirate Chest. What is the Porch Pirate Chest Made of? THe Porch Pirate Chest Cage with a medium-size package. In addition to the collapsible cage, the Porch Pirate Chest comes with a cable to secure the cage to the door baseplate or to some other secure location on the porch, anchoring hardware and bolts to permanently secure the cage to the porch, two 4-dial combination padlocks to secure the cable and the delivery, and a laminated instructional sign to guide delivery professionals in simple steps they need to take to secure each delivery. The Porch Pirate Cage collapsed for storage. 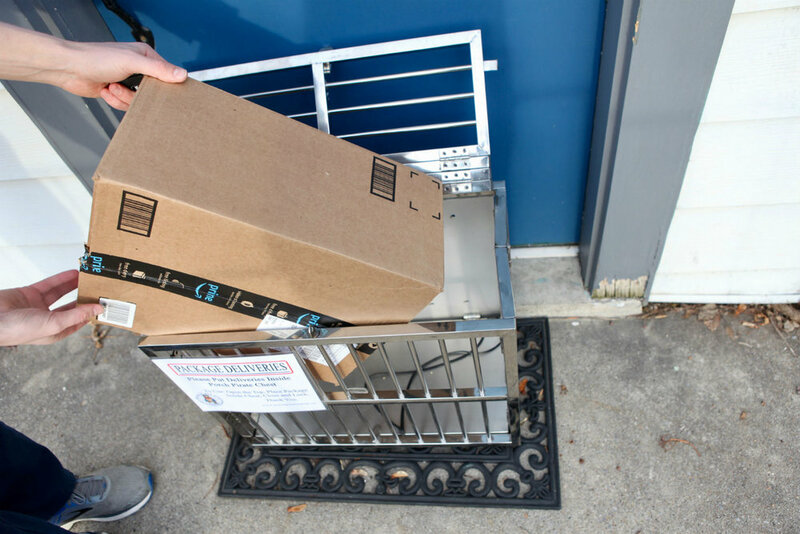 The Porch Pirate Chest is made of durable stainless steel framing and crossbars that can withstand wet weather without rusting while preventing porch pirates from stealing packages. Temporarily secured at your front door. It is light weight, and it easily collapses to be stored in your home until your next delivery is expected. THE PORCH PIRATE CAGE INSTRUCTION PAGE. CLICK TO EXPAND. The inventor and founder of the chest, Joe Baxter, told us that the design of the chest, with the visibility of its contents, is mindful of online shoppers who might be worried about kids playing with and getting locked inside a parcel box. This is the first parcel box we have seen that has considered this concern of parents. the porch pirate cage set up and awaiting a delivery. 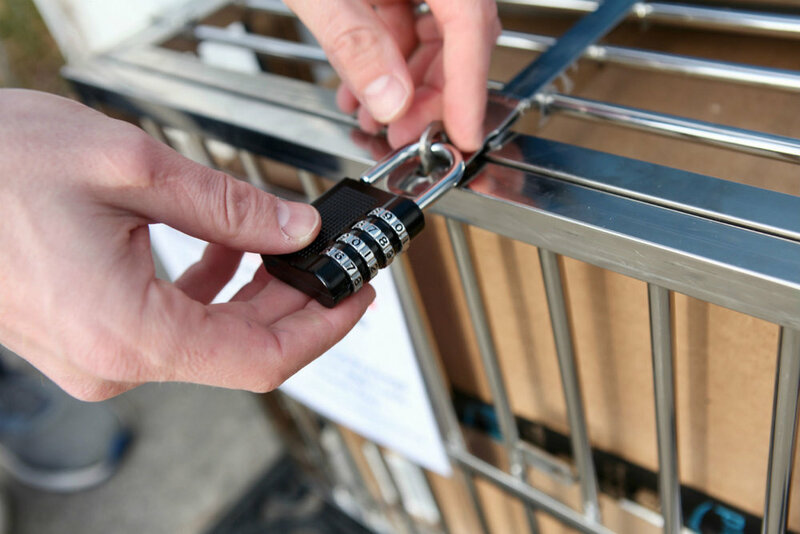 The cage has a top that folds down into place and has a latch that swings over a steel loop where the delivery professional would then secure the delivery using a provided combination padlock. 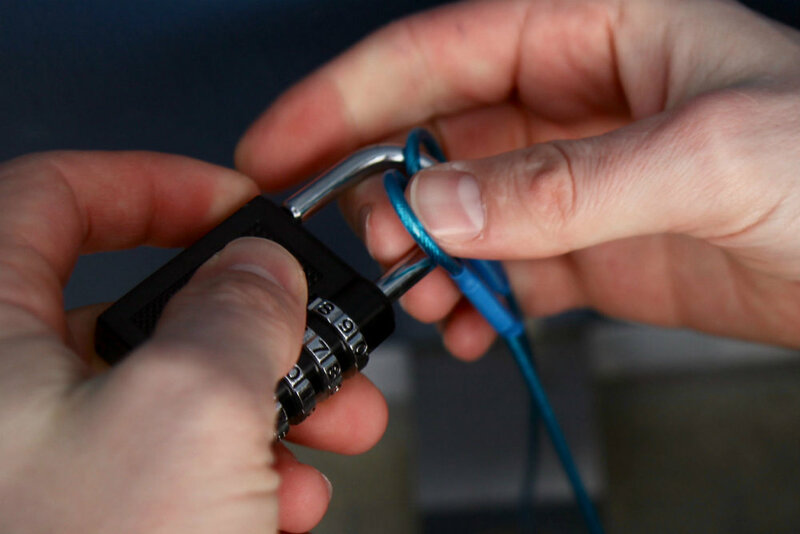 the 4mm steel cable and 4-dial combination padlock. 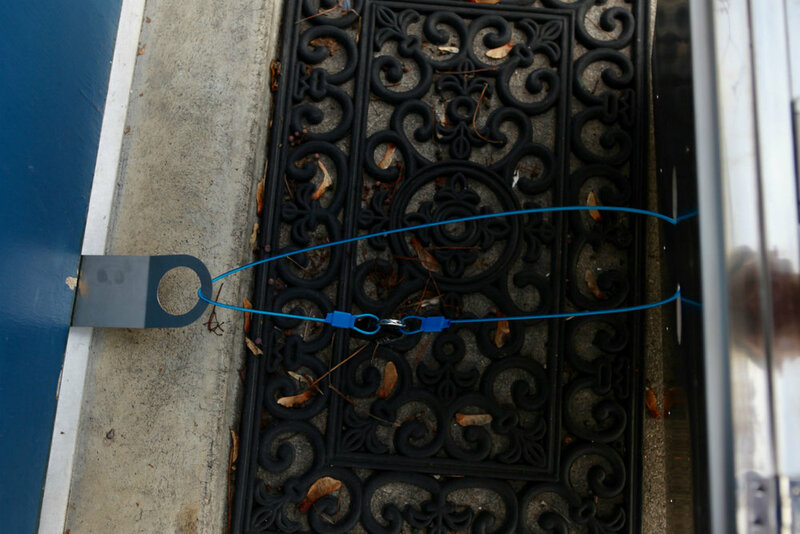 The Porch Pirate Cage has a small cutout on its back wall where the steel cable is secured to the cage and includes to looped ends to wrap around a securing point like the door baseplate or a porch railing. The cutout is large enough to accommodate other cables like a bicycle cable if the consumer wishes to change it out. 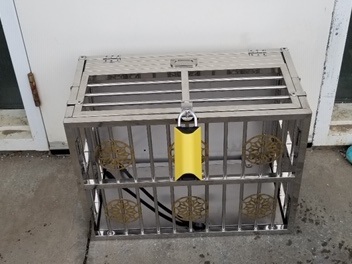 The Porch Pirate Cage Door Baseplate with 4mm steel cable and 4-dial combination padlock. The aircraft cable is about 4mm in thickness and is coated with blue vinyl to protect the material from weather. It is 36” in length which is sufficient length to attach the cage to securing points that are about the same height of the cage but not too much higher. The padlocks that come with the parcel box can be set to a custom four-digit combo and are pretty intuitive to use. The padlocks appear to be made by Wenzhou Jinhao Combination Padlock Co., Ltd., a China-based company. the Porch Pirate Cage with a BoxLock. The locks seem to be sturdy and took just a few minutes to set. We opted to set both combos to the same four-digit sequence to ensure we wouldn’t forget the code to unlock one of padlocks after use of the parcel box. Both the cable and the locking mechanism on the Porch Pirate Cage will work with most locks, so those hoping to use the BoxLock or other locking mechanisms will be able to do so (see . The door baseplate, also made with stainless steel, is engineered with a hole to loop the cable through and a sold end block. 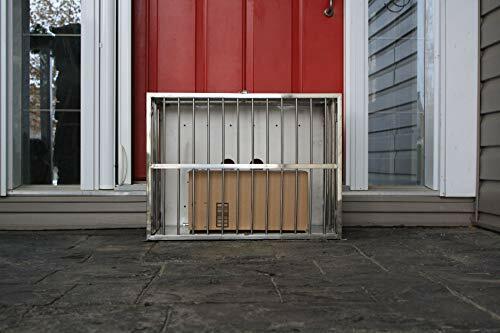 The owner of the Porch Pirate Cage would slide the plate beneath the delivery door and lock it. The plate’s solid block will prevent the plate from being removed, thus locking the Porch Pirate Cage to the delivery-receiving apartment or home. Securing a package in the porch pirate cage. We were particularly impressed by this ingenious design as other porch pirate solutions require a door with a handle to loop a cable through (if no other railings or other secure items are available). Regardless of whether one has a doorknob or a lever door handle with two contact points. Many online shoppers have limited landing space near their front door. In settings where space is limited with condos, apartments, town homes, RVs, mobile homes, and other housing layouts, the Porch Pirate Cage’s small storage footprint and collapsibility are big advantages over other bulkier porch security options. To Use: Open the top, place package inside chest, close and lock. Thank you. We learned that the Porch Pirate Chest’s two sizes — small and large — were developed by Joe after careful thought and investigation on common package sizes and consumer behaviors. We tested the small chest, and it seemed sufficiently large enough to receive small- and medium-sized packages. The small Porch Pirate Chest obviously takes up less space on one’s porch than the large option, but since both options fold up for storage, space shouldn’t be too much of an issue. On days you are expecting a delivery, expand the Porch Pirate Chest, place it on the delivery porch, and secure the chest to either the delivery door or a railing with the included hardware. Keep the delivery lid open with the lock placed in an unlocked position on the locking mechanism. The delivery professional will simply need to follow the delivery instruction provided on the instructional sign. If you’re expecting more than one delivery in a day, you can give the courier company the lock combination for use in cases where it’s already in a locked position containing a parcel. Pricing: How Much Does the Porch Pirate Chest Cost? 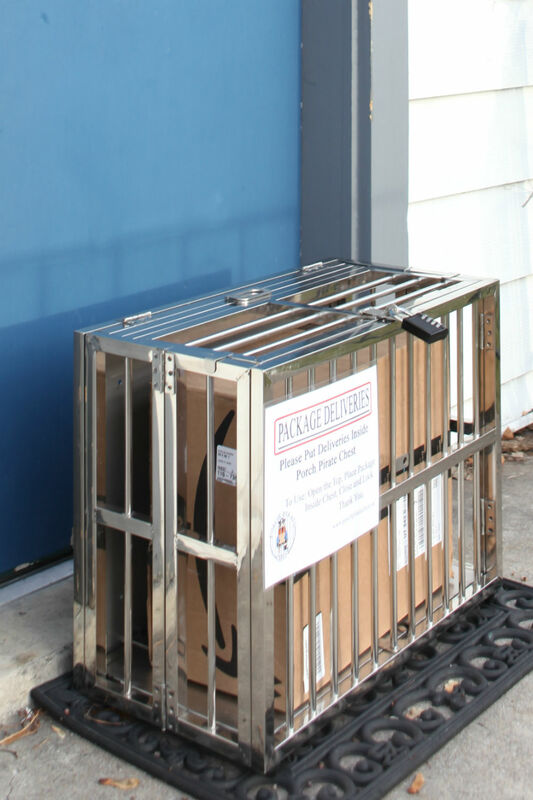 The Porch Pirate Cage is available both on the company’s website, https://piratesafeparcelcage.ca/, and on Amazon.com. The Porch Pirate Chest stands out for its innovative engineering and quality. We were impressed by its collapsibility and use of stainless steel. Prices on the website are in Canadian dollars and are currently priced as the introductory offer given the newness of the product. The small Porch Pirate Chest is listed on its website at C$179.99 (~$134 U.S. dollars) plus shipping and the large chest is listed at C$199.99 (~$149.37 U.S. dollars) plus shipping. The small Porch Pirate Chest is available on Amazon, but shipping costs may decrease if ordered directly from the Porch Pirate Chest Company. Parcel box options tend to be the most secure porch pirate solutions on the market, but they can also be some of the more expensive interventions. This collapsible mechanism is easy to use, but it’s important to watch your fingers (and kids’ fingers) when using it. It’s also not going to keep your packages dry on rainy or snow days, but many online shoppers have covered porches and most packages are relatively weather resistant. Given the build quality of the Porch Pirate Chest, the ease of use, and its low cost vs. other parcel box options, we believe it is a solid solution for those looking for a high degree of package security.